Ramadan Quotes from Quran and Ramadan Sayings from Hadith and great persons in Islam's history makes us remember what we should do in Ramadhan Mubarak and how we should say Happy Ramzan 2018 to our dear friends, family members and relatives or neighbors. 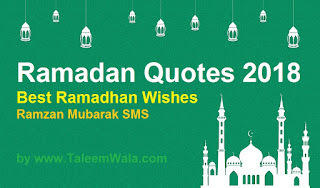 If you are the student who knows about TaleemWala.com than you will probably love this article about the best Ramadan kareem quotes, wishes and SMS collection which you can use to send Ramadan mubarak greetings to your loved ones. Ramadan, the month when you gradually realize it is not the devil. It is you. Do not be a servant of Ramadan. Be a servant of Allah. Be consistent. If you fasting but not praying your prayers, then all you doing is starving yourself. so only keep fasting is not enough, keep offering your prayers(Salah) as well. In holy month of Ramazan, the stomach may be empty. But the heart and soul are being fed. "Ramadan is a month of blessing. Allah blesses Muslims in this holy of Ramdan." "May Allah accept our Good deeds, fast, prayers and forgive our sins." And it is the month of sabr; and for sabr, the reward is paradise. O Allah, bless us in Rajab and Sha'baan and allow us to reach Ramadan. May Allah shower his countless blessings on believers on the holy month of Ramdan and always. Ramadan… Strengthen Your Imaan, Heal Your Heart. FASTING = Forgiveness, Acceptance, Self-Control, Truth, Integrity, Nourishment, and Grace. Ramadan is more about losing sins not weight. Spend some more time in sujood during Ramadan. May Allah keep you away from harm and trouble. As you fast and pray on Ramadan, may all of your sin be forgiven and may you be blessed with peaceful life for each day ahead. Ramazan Kay Pehla Ashra (10 Din) "Rehmat", Doosra "Maghfirat", Teesra Dozakh Say "Nijat", Hai. Ramadan is a month of Allah, Whose beginning is mercy, whose middle is forgiveness and whose end is freedom from fire. The lord you worship in Ramadan is the same lord you turn away from in all the others months. May this holy month of Ramadan chase away the depression and misery that is getting the best out of you. Happy Ramadan! If you want us to write more about Ramadan and events like that in Pakistan than comment below and we are here to get more great lists of event data for you. Don't forget to share this list with your loved-ones.